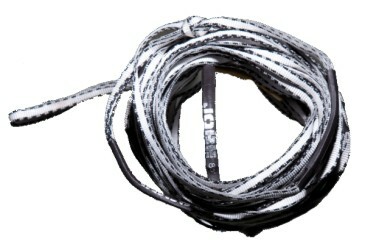 This strong and flat spectra line(2mm) will set the new high quality standard for wakeboard lines! The innovated woven technic that is used is super strong (break strength 22KN = 2.243 KG / 4.945 LBS), flexible and has absolutely no stretch. It's soft to handle, and it looks great! A must for every rider! 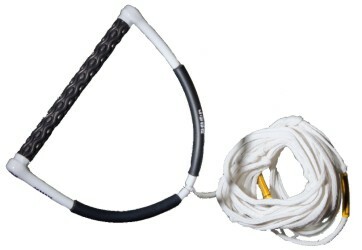 One of the safest tournament ropes available. Lowest elongation, highest break strength. A professional wide handle. For anyone who makes wake crossings on a long line. 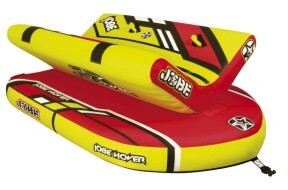 Ideal for all levels of skiers. The classic trick handle. Contoured leather strap for added comfort. Gives the skier a stronger hold on tricks. High quality front toe handle. Strengthened side protection. Made out of 3/8" Polypropylene with 16 strands of 64 fibers. 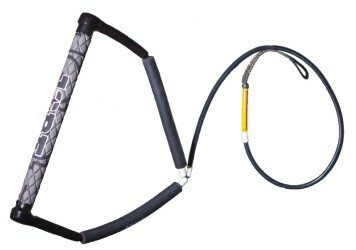 The "S" and "Z" twists give you better balance and strength. 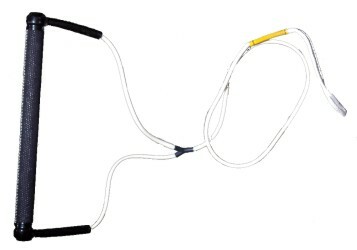 This mainline is designed to work with the Perfect Pass switch and starts at 15' off and can get as deep 44' off. 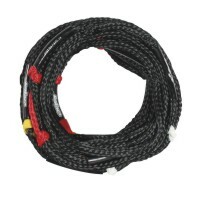 An 18" section rope is included to use when the switch is not in use. Lightweight construction. Easy to wrap mainline around the handle. 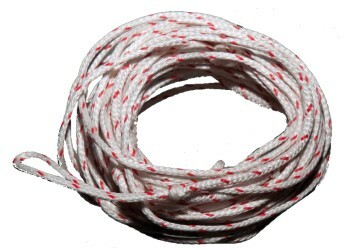 Spectra rope. Perfect floatation and no handle roll. Specs: EVA single density grip ø 1.1" width 15.75"
Weight is less than 0.65lbs. 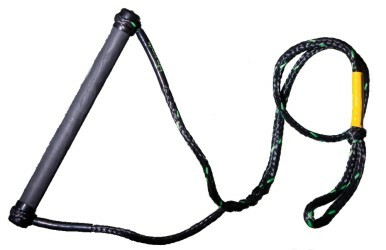 Spectra rope. 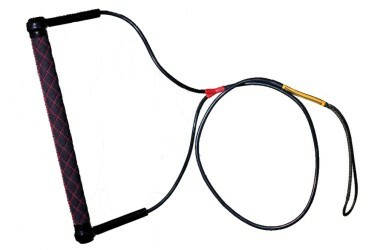 Construction profile allows a rider to wrap the mainline around the handle for easy storage. Perfect floatation. Finger protection on sides. No handle roll. Carbon 'featherweight' handle. EVA grip on key areas. 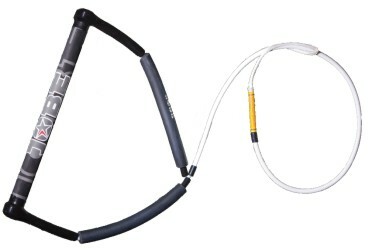 Spectra rope. Finger protection on sides. Lightweight handle. Double density EVA grip. Superb EVA grip. Pro handle out of ultra stiff spectra. Superb EVA Tractor grip. Lightweight stiff piping. Small floats. Friendly in use with easy wrap facility. Smooth rubber grip. Lightweight pro handle with superb EVA grip. 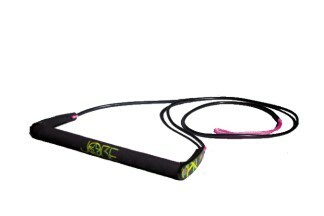 V-grip for wrapped moves. 100% spectra mainline, absolutely no stretch. Three 5ft (152cm) sections. Tangle free. 5ft (152cm) sections. No stretch. Made out of 3/8" Polypropylene with 16 strands of 64 fibers. 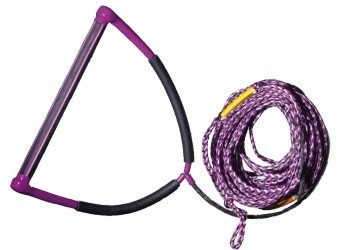 This rope utilizes what is called an "S" and "Z" twists to give you better balance and strength. EVA grip on key areas. 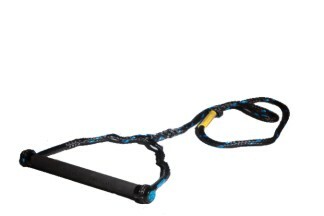 Spectra rope. Finger protection on sides. The grip of the Greptile is unequalled in waterskiing. Developed by 3M - the company that makes anything stick. 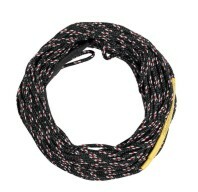 Made out of 1/4" Polypropylene rope using 4 rope construction for added strength. 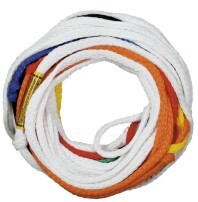 A real boarding rope, low stretch, super strong, thin & ultra light.